McCormick & Company, Maryland, U.S.
Old Bay Seasoning is a blend of herbs and spices that is marketed in the United States by McCormick & Company, and produced in Maryland. It is produced in the Chesapeake Bay area where it was developed by German immigrant Gustav Brunn in 1939, and where the seasoning is very popular to this day. At that time, crabs were so plentiful that bars in Baltimore, Maryland, offered them free and salty seasonings like Old Bay were created to encourage patrons to purchase more beverages. Old Bay is just one of many crab seasonings created during that era, yet it is one of only a few that survived. Notable others are J.O. Spice and Baltimore Spice. The seasoning mix includes mustard, paprika, celery salt, bay leaf, black pepper, crushed red pepper flakes, mace, cloves, allspice, nutmeg, cardamom, and ginger. It is regionally popular, specifically in Maryland, the Mid-Atlantic States, the Southern States, and parts of New England and the Gulf Coast. Due to the strong presence of the United States Navy in Maryland and Virginia, it is a common fixture in galleys onboard navy ships. Otherwise, it can be made at home, with instructions on its manufacture readily available. Old Bay Seasoning is named after the Old Bay Line, a passenger ship line that plied the waters of the Chesapeake Bay from Baltimore to Norfolk, Virginia, in the early 1900s. Gustav Brunn’s company became the Old Bay Company in 1939, the year he fled Nazi Germany, producing crab seasonings in the unique yellow can container until the company was purchased by McCormick & Co in 1990. McCormick continued to offer Old Bay in the classic yellow can. According to Gustav Brunn, he had worked for McCormick for a week before starting his own spice business. He claimed that he was fired when McCormick learned that he was Jewish. McCormick has a number of other products under the Old Bay banner, including seasoning packets for crab cakes, salmon patties and tuna, tartar sauce, cocktail sauce, and seafood batter mix. They also make other seasoning blends that mix Old Bay seasoning with garlic, lemon, brown sugar, herbs and blackened seasonings. 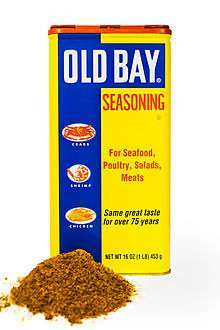 McCormick recently has offered a lower-sodium version of Old Bay Seasoning. In March 2013, Old Bay issued a limited-edition can featuring six players from the Baltimore Ravens football team. The players that were included were Joe Flacco, Torrey Smith, Terrell Suggs, Ray Rice, Haloti Ngata, and Lardarius Webb in order to celebrate the victory from the 2013 Super Bowl. The seasoning is chiefly used to season crab and shrimp. It is also used in various clam chowder and oyster stew recipes. The seasoning is also used as a topping on popcorn, salads, eggs, fried chicken, french fries, tater tots, corn on the cob, boiled peanuts, dips, chipped beef, baked potato, potato salad, and potato chips. Several movie theaters in the Chesapeake region offer it in the condiment section. Potato chip manufacturer Utz created the original "Crab Chip" based on an analogue spice mix. The popular potato chip variety was later copied and marketed by Herr’s (however, Herr's uses the Old Bay seasoning and it is sold as "Herr's Old Bay Chips"). Early in its history, the Subway sandwich shop used Old Bay when mixing their seafood and crab salad. Many local Subway shops in the Northeastern states still have Old Bay for use on sandwiches. Old Bay is also occasionally used around the Chesapeake Bay region as an ingredient in Bloody Marys, and as far south as The Breakers Hotel in Palm Beach, Florida. Old Bay Seasoning is available at every Boardwalk Burgers and Fries restaurant. In 2014, the Maryland-based brewery Flying Dog created an Old Bay-inspired summer ale named Dead Rise to celebrate the seasoning's 75th anniversary. ↑ Ingraham, Christopher (2014-05-07). "They put Old Bay on everything in Maryland. Soon you will, too". The Washington Post. Retrieved 2016-03-08. 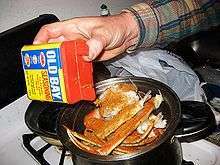 ↑ "Homemade Old Bay Seasoning". www.epicurious.com. ↑ "McCormick adds Old Bay products to its spice rack". The Baltimore Sun. 1990-11-01. Retrieved 2011-06-06. ↑ "McCormick buys locally invented Old Bay crab spice". The Baltimore Sun. 1990-11-01. Retrieved 2013-01-11. ↑ "Which six Ravens played their way onto the limited-edition Old Bay can?". The Baltimore Sun. 2013-08-22. Retrieved 2016-03-08. ↑ "Dead Rise - Flying Dog BreweryFlying Dog Brewery". Flyingdogbrewery.com. 2014-06-20. Retrieved 2016-03-08.